New feature: “Add Team to all open tasks”. 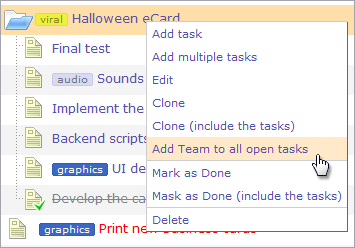 Ever wanted to add a new team member to all the tasks inside a project or to all sub-tasks? Now you can do that using the “Add Team to all open tasks” feature – available through the right click on projects and parent tasks. The time tracking tools have many features like adding teams and many more. I used these tools and they are perfect for time management. It allows you to collect and organize your employee time data simply and accurately. Planning and timing are the two foundation stones for any business venture. Choosing the right time tracking tool is important for a successful business. And now many online tools are available to help you in these areas for better management of your business. Previous post: New feature: Workload Reports!